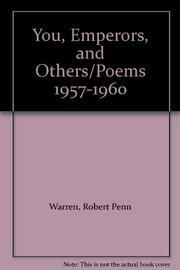 Robert Penn Warren is a Pulitzer prize winner and a versatile writer in many genres. Some of this variety is reflected in this latest book of poetry whose tone ranges from the abstrusely modern to some jingle interpretations of nursery rhymes. Perhaps the most successful poems are the traditional ones, on nature, love, time, the poetic retrospect, etc. But the poems concerned with the present, or with personalities, contain some fairly jarring colloquialisms. It is disturbing to find Ogden Nash rhymes- "Jantzen pants on" following "In time's concatenation and/ Carnal conventicle I". In theory, the juxtaposition of languages and styles is more fruitful than it would seem here where the mixture is not entirely successful.